The Bolingbrook Babbler: Web Exclusive: Is Lisle’s Garfield Pond home to a monster? Web Exclusive: Is Lisle’s Garfield Pond home to a monster? 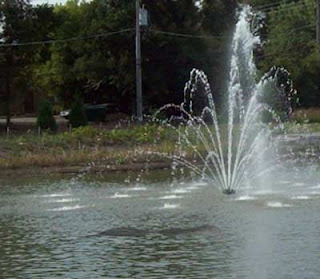 Several eyewitnesses claim to have seen a monster in Lisle’s newest pond, Garfield Pond. Located less than a block from the newly remodeled downtown, cryptozoologists are concerned. Don X. Zimmermann claims to have seen something while walking home. Zimmermann said ran back to the downtown and tried to tell a police officer what he saw. The officer, according to Zimmermann, arrested him for public intoxication. Zimmermann plans to fight the charges. Dawn, who asked that we not use her real name, claims she was sober when she saw the creature. Paula Z. Gonzalez thinks she heard the monster. Gonzalez says she ran towards a toddler that was playing near the pond, and tried to pick her up. The child’s parents screamed at her, and chased her. Gonzalez was later arrested for attempted child abduction. Summers believes that the monster is a shapeshifter. When asked about the possible monster in Garfield Pond, Mayor Joe Broda seemed to be unsure if it really existed. Elyse, blogger for Skepchick, spoke to this reporter while working out at the Community Park Fitness Center. “I’m sure some Lisle residents have seen something.” Said Elyse, “But that doesn’t mean it’s a monster. Our eyes can play tricks on us, or we can mistake an ordinary event as something extraordinary.” Elyse added that the monster could be the subject of her upcoming conference.